There is weight to the issues in Surrogates that contrasts with the slight plot surrounding it. Set in the not-so-distant future, technological advances have led to a world where humans live in the near isolation, interacting with the outside world via android replicas they control sensorially from the isolation of their bedrooms. Armies, police, and the general public at-large are almost exclusively populated by these robotic doppelgangers, and while most praise this technical advancement, a sizable minority of humans, called “Dreads,” rejects this unreality and chooses to cordon themselves inside sovereign, robot-free reservations. Heady stuff, indeed, and undoubtedly more prescient and enduring than the murder mystery director Jonathan Mostow lacquers over the obvious allusions to man’s inextricable march toward automation and fears of technology and government. 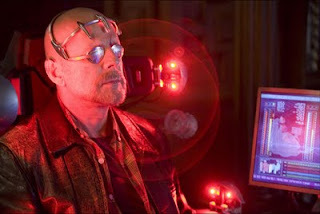 Some “meatbagger” (the derisive term for a person who ambles about in the flesh instead of using their proxy) begins running around with a secret weapon that not only disables surrogates but kills their human hosts, and the first victim turns out to be the son of Lionel Ganter (James Cromwell), the inventor of surrogate technology. Enter police detective Harvey Greer (Bruce Willis), who, along with his partner (Radha Mitchell), are assigned to investigate this sudden spree of serial surrogate killings. Having lost his son to an untimely death and his wife to the detached security of her younger-looking “surry,” Greer eventually rejects his own plasticine proxy – bad wig and all – for an in-the-flesh interaction with the world. By extension, there is a certain glee is watching Willis implicitly abandon a younger visage for his more wizened current incarnation. Willis has aged far more gracefully – physically and otherwise – than his ‘80s action star counterparts, and he usually elevates even his lesser films. Unfortunately, Surrogates falls into that category. Taking another stab at the man-versus-machine tableau after Terminator: Rise of the Machines, Mostow squanders lots of thematic potential on a cyberpunk whodunit that is as cold and lifeless as the titular androids and actually makes less sense by the time the film ends. And, as game as Willis is, the supporting cast is wasted on undeveloped or, in the case of Ving Rhames, downright silly characters. Surrogates is, well, a pale surrogate for a plethora of films with which is it fares poorly by comparison: Blade Runner, Terminator, I, Robot, and even WALL-E. It is like a beta version of a film in desperate need of an upgrade.